As individual artists, Nigel Cameron & Julie Hall, we have both had long established experience in performing and recording Celtic music. Ever since we first met each other, we have been playing and performing Celtic music together. Now working as a married couple, the sound we make together has been recorded on two 'Celtish' albums with high production values. Under the name 'Celtish' we seek to use the uniqueness and popularity of Celtic music to bring joy, peace and blessing to as wide an audience as possible and to help build bridges between Church & community at home and especially abroad. We hope to dispel some of the myths about the ancient Celts, and also share personal stories of our Christian faith. 'CELTISH DEVOTION' is the title of our new album, coming in Summer 2019. 'CELTISH' is the title of the first recording we (Nigel & Julie) have made of our own unique sound and is the third project to be recorded under our 'Sounds of Wonder' record label. It takes the form of an instrumental album featuring Celtic melodies that we love and powerful new compositions, played on Irish whistles and fiddle/violin. Whist 'Celtish' was the name of our first album, it also serves as the band name when we perform Celtic folk music at home or abroad, often with guest musicians to supplement our sound. A brief look at the output from the husband and wife team of Nigel Cameron and Julie Cameron-Hall shows an impressive array of projects all brought together through their Sounds Of Wonder label. Whether it is worship music with their international group The Worship Company, classical improvisation with their group Epiphany or Julie's work on baby music they are always looking for ways to use music to help people connect with God. 'Celtish' is the first instrumental album released through Sounds Of Wonder in 2016 and also acts as the banner under which they perform their Celtic inspired work. 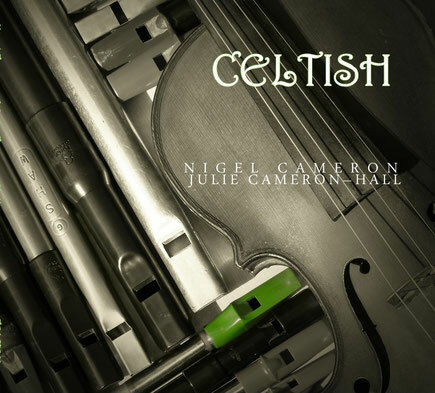 Prior to forming this project, both Nigel and Julie had been influenced by Celtic music with Belfast native Nigel a percussionist and Irish whistle player and Julie a classically trained violinist who released a number of folk albums earlier in her career. 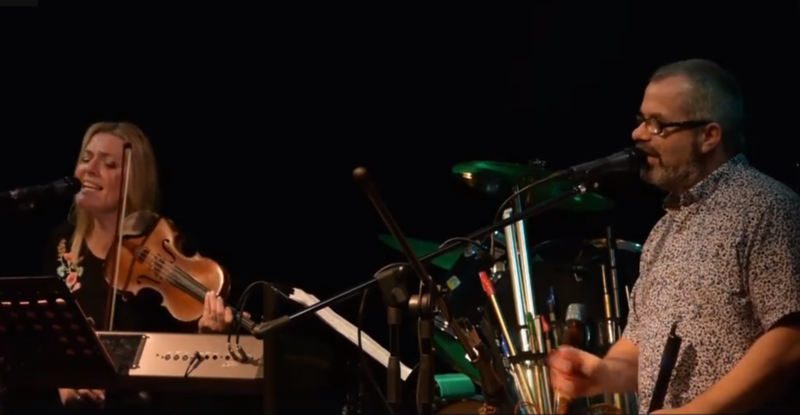 The album features a selection of classic Celtic tunes as well as some original compositions and draws on a wide range of instrumentation beyond Julie's violin and Nigel's Irish whistle featuring contributions from a number of musicians including regular collaborator Dave Bainbridge (Iona). The choice of tracks is a great blend of the ancient Celtic tunes such as "With My Love On The Road", known as the tune of "Be Thou My Vision", and more modern Celtic rock inspired compositions with Nigel Cameron's own "Celtic Jubilee" adding drums and electric guitar to the mix. Clearly a lot of thought has gone into the arrangements on each track, carefully selecting the pallet to paint a picture in sound. There are moments of delicate simplicity with just the whistle over a backdrop of synths on tracks like "Midnight Walker" or "Dunluce". The traditional Irish slip jig "The Butterfly" shows a playful side creating a sense of fun through the interplay between the whistle, violin and guitar. There is a real spiritual feel throughout the album as it washes over you leaving a feeling of peace and joy through the uplifting sounds beautiful soaring arrangements. I would recommend getting hold of a physical copy of this album as the sleeve notes provide an excellent accompaniment, offering fascinating insight into the background of each track. I began our talk by suggesting that the name Nigel Cameron & Julie Cameron-Hall was rather cumbersome. Nigel agreed. Nigel: That's why we came up with our ministry title, Sounds Of Wonder. It's kind of like a record label. We love recording music, and we help other people record music. The instruments we play, sometimes people wonder what on earth we're doing. But people love the Celtic sound, and it definitely evokes something. So we came up with Sounds Of Wonder as an umbrella for all our music. For the folk music we do, we've come up with this thing 'Celtish'. It's not pure Celtic music. We've both come to folk music from different backgrounds. Julie was classically-trained. I'm Irish but I'm not from a traditional Irish background: I came to folk music from Celtic rock. When we fuse those things together it's almost like an apology. Is it Celtic? Well, it's Celtish. 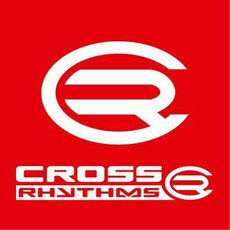 An example is our instrumental track where we attempted to do a traditional Irish tune, "The Butterfly". Julie: (helpfully interjecting) It's a slip jig. Nigel: When we tried to do it in a traditional way it just didn't have any life. We decided to experiment a bit. It's a three-part tune and we had this idea that if one of us plays the tune and the other one improvises, then we swap over. The clincher was to do this mysterious intro. Because it's called "The Butterfly", Julie did a bit of Vaughan-Williams at the start, which was quite butterfly-like. When I was doing the sleevenotes, we discovered that the writer of the melody, his father was a traditional musician but he was an eclectic composer and liked to fuse elements of classical and jazz into folk, which was frowned upon. That's what we do. Tony: Were you born in Northern Ireland? Nigel: I was born in east Belfast. You know that Northern Ireland is a divided land. We were very much in the Protestant east of Belfast. I went to Baptist churches. My family has been impacted by The Troubles. My mother's cousin died in the Enniskillen bomb. But we lived in suburbia and we had a happy childhood. We wouldn't go into the city centre at times. All the barricades - it was a pretty scary place to be. But now there's peace like there's never been. Belfast is booming in a very different way than it used to. It did affect us: you were never too far away from the damage. We waved our Union Jacks on the 12th of July because that was what we did, but in my early teens I was like, 'I don't want to do that anymore. I don't relate to this at all.' We walked away from it. The older generation - maybe at one time the Orange Order had Christians and they believed. But we walked away from that, and I got involved in music in churches. All my chums, when we discovered in the coffee bar era that we could do rock music as Christians, even though there were various books going around trying to say you couldn't, we started to use it for evangelism. From my earliest beginnings - my brother teaching us to sing harmony in little groups, playing any instrument we could find - we started a band called Soul Response. Julie: Soul Response were a very cheesy Christian-rock band. It's a long way from Belfast to Letterkenny. We wanted to get home early but unfortunately we couldn't because Adrian Thompson's amp blew up in rehearsal, and he needed to use our Peavey 50W Bandit. That was a great training ground: I loved to experiment. I started on drums and ended up the lead singer and then keyboard player. It was discovery of Celtic rock that got me into folk music by the back door - Gary Moore, Thin Lizzy, the early days of Sammy Horner doing his 'Celtic Praise'. There's a passion in that sound. When we were in the bass player's house one night trying this acoustic song called "Yesterday's Heroes" about the Beatles and Led Zeppelin going to Hell, the bass player gave me this tin whistle and said, 'I can't get much of a tune out of that. Can you?' I started to play this on one acoustic song in the set, and - I said this in the sleevenotes to our 'Celtish' album - he doesn't realise what he started in me, because the tin whistle, getting onto the low whistles, gave me an expression for my heart at different times in my life. The bending notes and the tone of that Celtic sound resonate deeply. It's like the sound of the land - a really ancient sound. It's given us this sound. When I come to England and play the whistle, I can do no wrong. I always apologised for playing it in Ireland. I grew up believing I wasn't a proper Celtic musician because I couldn't play a reel or a jig. People say, 'You're from Ireland - play us a jig.' Immediately I shut down. You don't play Celtic music if you're brought up a Protestant. This is the thing about Ireland and this division over 'religion'. It's not just religion, it's sport and it's music. When I moved churches in my early 20s, it was a saviour for me. We could only play music twice in the year: on Children's Day and at Christmas services. But when I moved to a very open Baptist church, almost the second week I was there they discovered I could play some instruments, and I started using whistles in worship. Wind on 10, 15 years, I had a one-day-a-week paid position in the church as music director and always would try and weave a bit of the Celtic sound into worship. It's only since marrying Julie and her being a fiddle player and having recorded folk albums and having a beautiful voice, the different streams we follow in, we just love to do it all the time. Tony: The first album you recorded together was simply called 'Celtish' and it was instrumental. Tell me about it. Nigel: It was all about celebrating my influences. The clincher for doing this album was remembering a little bit of a melody that I'd come up with myself and has been in my head 25 years, inspired by the genre of Celtic rock. We ended up calling it "Celtic Jubilee" and it's the opening track on the album. Amazingly, we got Dave Bainbridge from the band Iona to put his mark on it. He's played on a few of our albums. I gave him a few of the references - Thin Lizzy and Gary Moore, but this is a violin and whistle sort of melody - and he added all his textured sounds. He gave us so much electric guitar and bouzouki - so many layers, wonderful stuff - that we made it into two tracks. People who read the sleevenotes to that album, even though it's instrumental - we have weaved testimony and prayers for the listeners that they would let the power of the music minister peace and healing into them. That's why I believe that it's a Christian album.